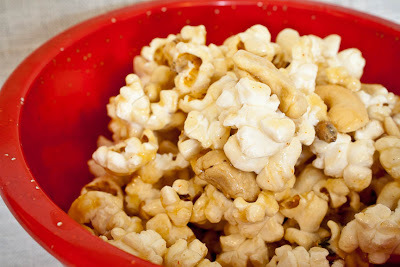 My friend Ashley spent all last week raving about her incredible maple cayenne popcorn. She gave me the recipe she used from December's Cooking Light Magazine. I'm not one for carmel corn, but holy moly was Ashley right. It's sweet, salty and just the right amount of spicy. This popcorn deserves some kind of professional Nom Nom Award. First prize! Heat oil in a large saucepan. Add the popcorn, cover and shake till kernels are popped. Stir in the cashews. Meanwhile, add the sugar, syrup, butter, salt and cayenne to a small saucepan and bring to a boil. Cook for one minute, stirring frequently. Pour syrup over popcorn and cashews and stir. Spread out on a parchment-lined cookie sheet and let cool at least 3 minutes. I stirred the mixture around on the cookie sheet to combine everything better.